DENVER, CO (January 23, 2019) —The Intrepid Sojourner Beer Project® is Colorado’s “Best New Brewer” in the RateBeer Best Awards for the year 2018. The award is based on ratings made by beer-drinking customers on its platform, with particular emphasis on tasting ratings made back to January 2018. “New brewers” started collecting their first ratings on or after Q3 2017. The Intrepid Sojourner Beer Project® was founded in May 2017 at 925 W 8th Ave. in Denver’s Art District on Santa Fe. The brewery augments standard beer styles with adjuncts inspired by cuisines the world over, including its Turkish Coffee Stout, Basil IPA, Lavender Tripel, Pear Saison, Chamomile Hefe-Wit, and its 2018 World Beer Cup Silver winner in the Experimental Beer category, Hickory Peach Wee Heavy. RateBeer best is one of the most comprehensive beer competitions in the world with more than half a million beers from 27,000 brewers worldwide tallied. RateBeer was founded in 2000 and has hundreds of thousands of members. Avery Brewing’s Mephistopheles Stout won Colorado’s top beer award, while Casey Brewing and Blending was the state’s top brewer. Oh, happy day! Hickory Peach, which debuted at the Beers Made by Walking festival last year, will be part of the Intrepid Sojourner's one-year anniversary bomber releases next week. A Westword favorite, it won silver at the World Beer Cup in the Experimental Beer category. DENVER, CO (May 14, 2018) — The Intrepid Sojourner Beer Project® took home its first major-competition hardware this month with the World Beer Cup 2018 Silver Award in Experimental Beer for its Smoked Hickory Peach Wee Heavy. The brewery’s award comes within its first year of existence, opening on May 20, 2017. Inspired by fusing the Indiana roots and affinity for all things Colorado of the co-founders, the wee heavy-style brew incorporates 30 lbs. of shagbark hickory bark from the forests of southern Indiana and 100 lbs. of peaches from the Colorado Palisade hills, fusing the caramel and marshmallow notes of roasted hickory bark with the sweet & smoky flavor of roasted and smoked peaches. Partially caramelized by hot stones, the adjuncts are then roasted together and blended. Moore, who moved to Colorado in 2010 to work on a PhD in Classical archaeology at University of Colorado Boulder, adopted homebrewing as a hobby and became interested in using the flavors from cuisine in Turkey, Jordan, and Greece, where he was on archaeological digs, in his recipes. By opening his own brewery, he is able to expand that influence to tastes from all over the world. The Silver Award comes just as Intrepid Sojourner celebrates its first anniversary. The Smoked Hickory Peach Wee Heavy was one of five beers the brewery will release in bottles in its taproom at 925 W 8th Ave. in Denver this week, its first set of bottle release. Monday is the Barrel Aged Imperial Turkish Coffee Stout; Tuesday, the Smoked Peach Hickory Wee Heavy; Wednesday, the Imperial Basil IPA; Thursday, the Belgian Quad; and Friday, the Imperial Sahti. DENVER, CO (April 27, 2018) — The Intrepid Sojourner Beer Project® will celebrate its first birthday with a party on Saturday, May 19, at its brewery and taproom at 925 W 8th Ave. in Denver’s Art District on Santa Fe. In addition to a beer garden, band, and Barbed Wire Reef food truck, the brewery will celebrate with beer: A firkin tapping, beer infusions, and any unsold beer from its preceding-week gauntlet of 22-oz. bottle releases and special infusion flights. Monday will see the bottle release of the Imperial Turkish Coffee Stout; Tuesday, the Peach Hickory Wee Heavy; Wednesday, the Imperial Basil IPA; Thursday, the Belgian Quad; and Friday, the Imperial Sahti. A special flight of beers brewed on the brewery’s new pilot system, each with four infusions, will be available nightly in the taproom: the Middle Eastern Saison (infused Monday with za’atar, ras el hanout, khmeli suneli, and advieh); the Carrot IPA (Tuesday, with ginger, Sichuan peppers, beats and cilantro, and chilis); the Garlic Amber (Wednesday, with roasted, fermented, black, and Creole garlic); a sour (Thursday, with blueberries, blackberries, raspberries, and strawberries); and the Coffee Session Pale Ale (Friday, with Aztec cocoa, Robusta coffee, Arabica coffee, and smoked coffee). Any beer left over will be available, un-infused, on Saturday. Brewer and cofounder Andrew Moore will kick off the week at 7pm Monday, May 14, in the taproom with a presentation about brewing with adjuncts. The week will also see the launch of the Intrepid Sojourner Beer Club: For a $150 membership, members get a mug with $1 off pours all year, select free brews at Intrepid Sojourner’s international parties, free entry into the brewery’s international-trip giveaways, a t-shirt, a holiday party, and early access to future bottle releases. From Bavarian to French to Turkish and Peruvian-style beers, this new around-the-world taproom taps into its owner’s travels for new ingredients and slight twists on the standard craft beer styles. See Italian Basil IPAs, Imperial Turkish Coffee Stouts, and Chicha brewed with corn, cinnamon, clove, and lime juice. The adventures and tales of Colorado ales continue at one of the most adventurous breweries yet! Take a trip around the globe with a variety of beers that use adjuncts from their region to represent each beer poured as you venture to the Santa Fe Arts District to enjoy the crafts Andrew and Ben are brewing and serving at The Intrepid Sojourner Beer Project. Andrew used his studies to travel some of the globe and was able to experience cultures and cuisines, and in turn, he used those inspirations to help emulate the heritage within the beer he brews. He met Ben along the way who had just finished school and was looking to investing into a small start-up, and with their powers combined (and the help of their moms) these two are almost a year into this voyage in their vessel. Archeology student turned craft brewer, Andrew Moore’s travels inspired the brews you’ll experience at BBF and the taproom’s brewery, Intrepid Sojourner. I came out to Colorado in 2010 to go to graduate school in Classical Archeology, doing home brew with friends as a hobby. DENVER, CO (March 9, 2018) — The Intrepid Sojourner Beer Project™ will give away a trip to China at 7 p.m. March 31. Since the promotion was announced in January, customers have been entering tickets into a drawing by redeeming loyalty points they earn with their taproom purchases – one entry for every 50 points. While the winner of the China-trip drawing does not need to be present to win, entrants must be in the taproom to win consolation prizes, such as TSA Pre-Check application vouchers – as well as to be alternates if the winner does not claim the prize. Saba’s Ethiopian Food truck will be serving in the brewery’s Beer Garden at 925 W 8th Ave.
Also, three beers will be released the day of the drawing: A smoked Polish Grätzer; the Gretelbier, a gingerbread-spiced helles bock brewed in collaboration with Spice Trade Brewing; and Intrepid Sojourner’s first sour, an imperial saison aged in chardonnay barrels, brewed with 105 West Brewing of Castle Rock for the Colorado Brewers Guild’s Collab Fest. “It’s a bit like counting jelly beans in a jar, but it looks like we’ve got about a hundred entries so far,” taproom manager Kevin McCrossin said. “I expect more people to be redeeming them in the run up to the drawing – plus, people have been saving points for bigger-ticket rewards like sweatshirts.” Intrepid Sojourner loyalty points are earned and redeemed for beer and merchandise in addition to China-trip entries. The 10-day tour for two will visit the Great Wall, Tiananmen Square, the Terra Cotta Soldiers, and Shanghai and include round-trip airfare from San Francisco as well as all transportation within China, deluxe & first-class hotel accommodations, and 8 buffet breakfasts, 2 lunches, and 2 dinners. DENVER, CO (February 24, 2018) — The Intrepid Sojourner Beer Project™ will host Sean Guerrero, owner of Denver’s upcoming Jade Mountain Brewing Company, in its taproom at 7:00 p.m., Monday, February 26, to speak about the craft beer business in China and serve free samples of Jade Mountain test brews as the latest in its bi-weekly “Obscure Sojourns” speaker series, co-hosted with Atlas Obscura Society’s Denver chapter. Intrepid Sojourner has worked closely with other startup breweries in the past, including brewing Dos Luces Brewery chicha recipes on contract to serve in its tasting room, hosting Dos Luces’s founder, Judd Belstock, for an Obscure Sojourn talk, and hosting Guerrero to sample his brews and promote Jade Mountain at Intrepid Sojourner’s Chinese New Year party earlier in February. Guerrero will bring two Jade Mountain beers: Jasmine Lager, a rice lager with both sake and lager yeast; and the Gui Hua (sweet osmanthus flowers) Witbier, a Belgian-style wheat with Mandarin orange peel, a Sinophilic take on a standard wit ingredient. Guerrero opened the first iteration of Jade Mountain in a small town in China, inside an old tea house; the vast array of exotic fruits, spices, and teas in China provided an incredible opportunity to craft interesting beers. “It’s also great working with Dos Luces and Jade Mountain because they have the same vision that we do: Bringing new kinds of beer to this crowded Denver brewery market, and, in particular, beers with international influences,” Intrepid Sojourner co-founder and brewer Andrew Moore said. The Intrepid Sojourner Beer Project™ opened May 20, 2017, at 925 W 8th Ave. in Denver’s Art District on Santa Fe. DENVER, CO (January 9, 2018) — The Intrepid Sojourner Beer Project™ will a customer give away a trip for 2 to China on March 31. “Our brews both inspire wanderlust and draw their inspiration from sojourns to different cultures. We want one of our customers who gets that in our tasting room to also have the opportunity to experience something exciting out there like this,” taproom manager Kevin McCrossin said. The 10-day tour will include the Great Wall, Tiananmen Square, Terra Cotta Soldiers, & Shanghai. It includes round-trip airfare from San Francisco; all transportation within China; deluxe & first-class hotel accommodations; & 8 buffet breakfasts, 2 lunches, & 2 dinners. Customers who join the brewery’s customer-loyalty program, run through FiveStars, will earn a rewards point for every dollar spent in the tasting room at 925 W 8th Ave., Denver; on Saturdays, customers earn two points for every dollar. Every 50 points can be redeemed for an entry ticket (in addition to other program rewards); there is no limit to the number of entries per customer. The winning ticket will be drawn at a party in the taproom on March 31, 2018. In keeping with the theme and its series of successful international parties such as Day of the Dead, Oktoberfest, and the Bastille Day saison fest, the brewery will have a Chinese New Year party on February 17. 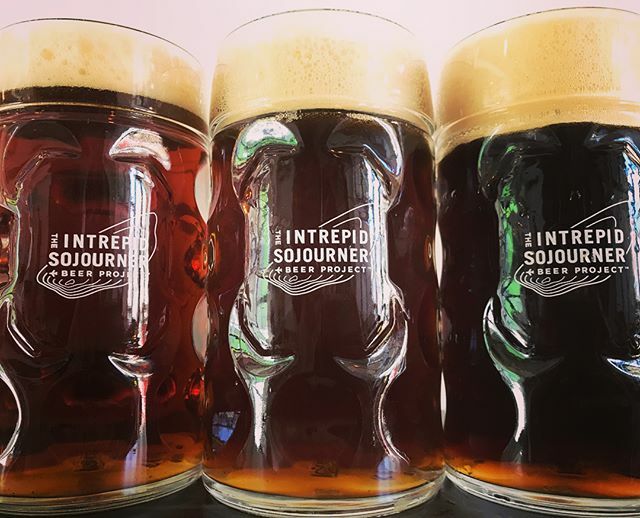 The Intrepid Sojourner Beer Project opened in May 2017 in Denver’s Art District on Santa Fe, brewing beers crafted from international influences. DENVER, CO (October 12, 2017) —Following the success of July’s Bastille Day saison fest and last month’s Oktoberfest, The Intrepid Sojourner Beer Project™ will co-host a Día de los Muertos party with its neighbors Museo de las Americas on Friday November 3, 2017, in conjunction with November’s gallery walk in the Art District on Santa Fe. Festivities will occur both at Intrepid Sojourner at 925 W 8th Ave. and at Museo at 861 Santa Fe Dr.
At 7:00 PM on Monday, October 23, the twice-monthly Sojourner Beer Talkco-hosted with the Denver Atlas Obscura chapter will also be co-hosted withand presented by Museo and will feature free sugar skull decorating for attendees. Day of the Dead, celebrated from October 31 to November 2, is an important celebration of life among the people of the Americas. For the November party, Intrepid Sojourner will release an Horchata Milk Stout and a Mango Habanero Pilsner and will have guest taps of Mexican-inspired beers from local breweries. A food truck and the band The Sweet Muffs & Co. will round out the festivities. The Intrepid Sojourner Beer Project opened May 20, 2017, with beers crafted from international influences. Museo is the premier Latin American art museum in the Rocky Mountain Region, dedicated to educating community through collecting, preserving, interpreting, and exhibiting the diverse arts and cultures of the Americas, from ancient to contemporary, though innovative exhibitions and programming. It has served the Denver community for 26 years through award-winning exhibitions, arts education programming and special events. Most Excited For: Brewer Andrew Moore is most excited about the five farmhouse ales from Scratch Brewing called Leaves, Roots, Seeds, Bark and Flowers. DENVER, CO (September 30, 2017) — Andrew Moore, founder and head brewer of The Intrepid Sojourner Beer Project™, has been selected to give the closing presentation for the 2017 Brewer’s Studio Pavilion in the Great American Beer Festival’s Meet the Brewer Hall at 6:30 p.m. on Saturday, October 7. One of 10 presenters, Moore, 31, is the only Denver brewer and, along with his former archaeology classmate at CU Boulder, Avery’s Travis Rupp, one of two Coloradans. Moore will deliver an expanded version of the talk, accompanied by a free tasting, in Intrepid Sojourner’s taproom at 925 W 8th Ave. at 7PM on Monday, October 9. Entitled “Brewing with Adjuncts: Taking Back a Dirty Word,” it will focus on the use of spices and fruits to complement and enhance the flavors natural to the malts, hops, and yeast of beer – and how it is the forefront of brewing innovation, unlike the common perception of “adjuncts” as the rice and corn that macrobrewers use to cheaply produce their brews. “Intrepid Sojourner focuses on internationally-inspired variations on traditional styles, many finding their roots in world cuisines,” Moore said. “Beer is food!” He opened the brewery less than five months ago. His creative beers, such as the Basil IPA, Turkish Coffee Stout, Lavender Tripel, Chamomile Hefe-Wit, and Apricot-&-Date Hefeweizen – and his commitment to regional and historical styles such as Grätzers, Sahtis, and Australian Sparkling Ales – have earned him notoriety and a reputation. From Rocky Mountain oysters to dark chocolate, try some of these weird, wonderful and extreme brews to take your appreciation of Denver craft beer to the next level. And this is merely a sampling to get you going on a tasty adventure in Colorado. This amber ale from upstart Denver brewery, The Intrepid Sojourner Beer Project, focuses on the maltier side of things in order to complement the garlic flavor. The brewery pulls inspiration for its beers from world travels and world flavors. Garlic might be an expected ingredient to many foods across the globe, but in beer it is definitely extreme. DENVER, CO (September 11, 2017) — Following up on the success of July’s Bastille Day saison festival, The Intrepid Sojourner Beer Project™ is hosting a weeklong Oktoberfest celebration at its taproom at 925 W 8th Ave. in Denver’s Art District on Santa Fe beginning Monday, September 25, culminating with an outdoor biergarten on Saturday, September 30, in the latest installment of its international holiday-themed parties. The next will be Dia de los Muertos in November. Intrepid Sojourner will be re-releasing its fast-selling Chamomile Hefe-Wit hybrid-style wheat beer and its Apricot-&-Date Hefeweizen Wednesday and Thursday, respectively, followed by the release of its Pilsner – the brewery’s first lager – Friday night. Saturday’s biergarten will being specialty pilsner releases, as well as guest taps from local German-beer experts Prost Brewing and Seedstock Brewery. “We wanted to give people a breadth of German beers and a ton of fun activities to keep them busy all week,” taproom manager Kevin McCrossin said. “It’ll be a week-long party. After our regular Sojourner Beer Talks [this week’s being “Almost Everest”] Monday and trivia Tuesday, we’ll round out the week with nightly beer competitions.” Wednesday bring a blind beer tasting; Thursday a quarters competition; and Friday a flip cup competition. Food trucks are scheduled each night, and live music on Thursday and, outside in the biergarten, on Saturday, a day that will also feature beer pong and stein races and hosting contests. Litersteins are available for purchase, while supplies last, for $12 in the taproom, which come with a free fill and 32-oz. fills for the pint price of select beers throughout the week and every Wednesday thereafter. Helmed by an archeologist, this Lincoln Park brewery not only showcases beer styles from around the world but also experiments with exotic ingredients to yield house drafts like Finnish sahti and garlic amber ale. In the taproom, decorative maps and suitcases continue the theme of world travel, while a patio makes prime seating for scheduled food trucks dispensing all sorts of cuisine. DENVER, CO (June 30, 2017) — In keeping with its international theme, The Intrepid Sojourner Beer Project™ will host “A Celebration of Saisons” with an outdoor beer garden, Maine Street BBQ food truck, and live music by Paris Swingset at its taproom at 925 W 8th Ave. in Denver’s Art District on Santa Fe, inhonor of Bastille Day, Saturday, July 15. “This is one of the most interesting styles of beer available – different strengths, different malts, different flavors,” founder and brewer Andrew Moore said. The brewery will serve a 9.3% imperial saison, as well as a saison rye, with four specialty flavors released every two hours and guest taps of “farmhouse brews” from Cannonball Creek, CO-Brew, Black Sky, and Resolute. French saisons were traditionally pale ales brewed in cooler months, then stored and served to farm workers during the summer. Each worker was allowed up to 5 liters for each day worked. “This is a great way to focus on a particular nation’s beers while promoting its holiday, co-founder Ben Gettinger said. Intrepid Sojourner is partnering with Denver’s Alliance Francaise to throw the party. Bastille Day celebrates the storming of the Bastille Castle in Paris on July 14, 1789 during the French Revolution and the Fête de la Fédération celebrating national unity on the same day the following year. We arrived at Intrepid Sojourner Beer Project on the afternoon of their grand opening. They were packed with thirsty craft beer lovers, ready to try something bold and new. They would not be disappointed… but more on that later. The small parking lot was converted to an outdoor patio for the event, which many customers took advantage of it on such a beautiful day. Barbed Wire Beef was there, cooking up tasty food to accompany the beer. It was the perfect makings of a great grand opening party. Garlic, basil, lavender and chamomile — on a list of expected flavors to find in a beer, those four items would be at the bottom. But for the newest brewery in Denver, The Intrepid Sojourner Beer Project, that is exactly the point. The base beers are all traditional, but each addition is meant to take the drinker on an international journey from their location in the heart of the Santa Fe Arts District. 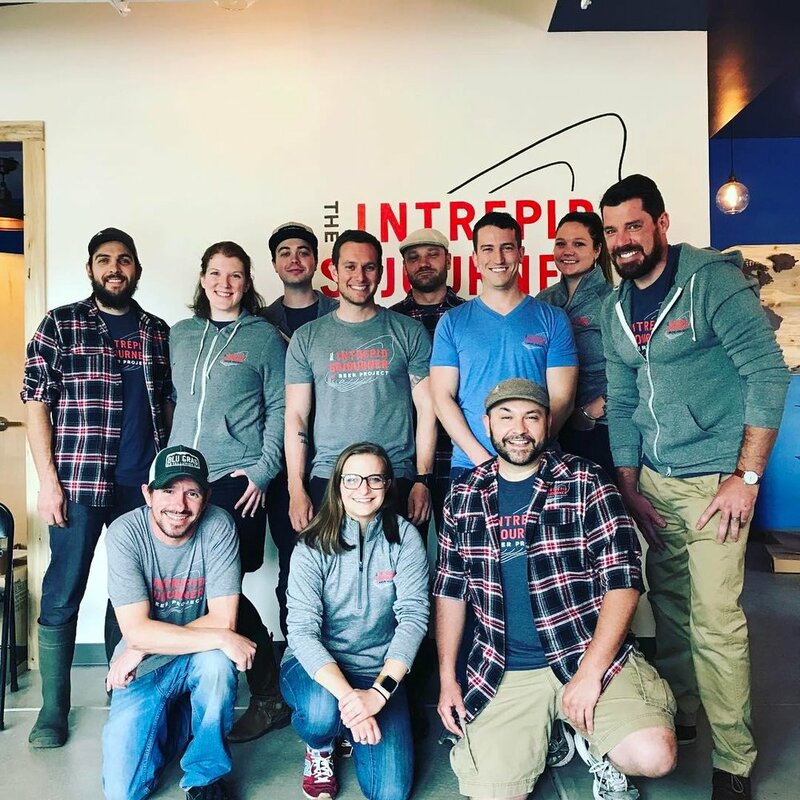 The Intrepid Sojourner Beer Project, the newest addition to the Mile High City brewing scene, is hosting a grand opening on Saturday, May 20 at its space at 925 West Eighth Avenue. Founders Ben Gettinger and Andrew Moore had their hearts set on bringing some international flair to their beers and that is exactly what they did. Over the past decade, craft beer has risen from relative obscurity, to relative general commercial buy-in and now reached the point of exploring the next great frontiers of innovation. From spirit barrel-aging, to mix-culture sours and wilds, lupulin powder to adjunct ingredients, our understanding of beer continues to expand each and every day. Punch your round-the-world ticket tomorrow when Intrepid Sojourner Beer Project, Denver's newest brewery, opens its doors for the first the time at 925 West Eighth Avenue in the Art District on Santa Fe. Intrepid Sojourner Beer Project co-founders Andrew Moore, Ben Gettinger, and Nick Fredman have had little time to rest in the first five months of 2017. In mid-January, the team broke ground on its new brewery in the Santa Fe Arts District. Ninety-five days later, they moved in, and Moore—also the head-brewer—was creating their first batch of beer in the new digs. The proprietors at Intrepid Sojourner Beer Project began to slowly open the garage door this week in the Art District on Santa Fe, inviting everyone from contractors and industry peers to the media to sample their unusual lineup of brews. DENVER, CO (May 11, 2017) — The Intrepid Sojourner Beer Project™ has hired its opening staff to serve customers at its tasting room at 925 W 8th Ave. in Denver’s Art District on Santa Fe. Kyle Freeman, who has been in Colorado since childhood, has a data science background and comes most recently from Tivoli. Colorado Native Chris Friermood comes from Deep Draft and works on his own educational startup. Chad Ickes joins after a stint at Brian Common, his first Denver beer stop after working at a craft beer bar in Columbus, Ohio. Sarah Lawrence brings experience as a local art-gallery event coordinator and has experience working at and starting restaurants in her native Boston. Gates Minis, from Savannah, Ga., worked at Fiction Beer Co. for its first two years of operations and has experience at River North Brewing and First Draft, as well as several years of volunteer experience at GABF. Joey Seaman worked at Firestone Walker in Southern California before relocating to Colorado. Ft. Wayne, Ind., native Savannah Snyder brings a graphic design background and experience serving at the Mountain Sun family of establishments. “I’m pumped about this group. Training has gone fantastically well,” said company partner Nick Fredman. The Intrepid Sojourner Beer Project opens to the public May 20 and will serve brews inspired by flavors from around the world. A new craft brewery is coming to the Santa Fe Arts District. The Intrepid Sojourner Brewing Project will open late May at 925 W. Eighth Ave. in a 2,200 square foot home. The space also features a 350 square foot patio and tap room. Andrew Moore and Ben Gettinger are opening Intrepid Sojourner Beer Project, a brewery that will specialize in "internationally inspired twists on traditional beer styles." That means the Belgian-style tripel will be made with lavender, the stout will be brewed with Turkish coffee, and the amber will be made with garlic. You can find those and several other beers today during the grand opening. Moore, the head brewer, used to be an archaeologist, which is why the beers will feature ingredients from around the world. The brewery, located along the busy Eighth Avenue corridor in west Denver, will also feature maps and travel decor. DENVER, CO (April 25, 2017) — The Intrepid Sojourner Beer Project™ will open its doors to the public on May 20, 2017. Located at 925 W 8th Ave. in Denver’s Art District on Santa Fe, the new brewery will serve approximately twelve brews at opening, many inspired by flavors from around the world. “We are thrilled that we are finally almost ready to let the public drink our beers,” founder and brewer Andrew Moore said. After the opening weekend, the taproom will be open seven days a week. The opening lineup will include not only commonly found brews such as a Belgian Blonde, an Irish Red, and a 120-IBU, 9.8% ABV Rye IPA, but also niche regional and historical beers like a Polish Grätzer; hybrids like a “Chamomile Hef-Wit,” a Strong Scotch Ale brewed with peated malt evoking Islay scotches, and a brown ale mixing American and British styles; and exotic takes on traditional styles like an Apricot-and-Date Hefeweizen, a Pear Saison, a Basil IPA, a Garlic Amber, a Lavender Tripel, and a foreign/export stout with Turkish coffee, cardamom, and sweet orange peel. “Free tasting events we’ve done lead me to believe the Basil IPA and Turkish coffee stout will be very popular,” Moore said. The homebrew iteration of his Strong Scotch Ale won Best of Show at the Avery Strong Ales Homebrew Competition in 2012. The beers are produced on a brand-new seven-barrel system from Alpha Brewing Operations out of Lincoln, NE. Moore plans to keep all six fermenters full as long as it takes to work up to filling the tasting room’s 20 tap lines, a couple of which will be devoted to kombucha or soda for the non-beer drinkers in a group of customers. “We want our taproom to be a place where everyone feels comfortable,” Moore said. General contractor BUILT. Construction is providing travel-themed interior décor, such as painted topographic lines, a suitcase-shelf wall, and a magnetic world map. DENVER, CO (January 6, 2017) — Renovations are underway at the site of Sojourner’s Brewing Project, LLC’s future brewery at 925 W 8th Ave. in Denver’s Art District on Santa Fe. “We’re so excited to get to this point. It’s been a long time trying to realize this dream, and this groundbreaking is an important step,” said founder and brewer Andrew Moore. The company retained local architect William Wood to design the new space, which recently underwent an interior demolition, leaving only the shell. Woodhas recently worked on local breweries including Little Machine Beer, Seedstock Brewery, the upcoming Zuni Street Brewing Company. BUILT. Construction of Longmont is the general contractor, which worked on Copper Kettle Brewing, is just completing Backstage Coffee, and also has an upcoming cold-storage project with Left Hand Brewing. The approximately 2,200-square foot building will house the production facility in approximately half of the available space and the 58-capacity taproom in the other half. A patio will rest out front, with a five-space parking lot facing 8th Ave.
Two local brewers, Andrew Moore and Benjamin Gettinger will open Sojourner's Brewing Project in January, 2017, BusinessDen reported. The coming attraction will be located in a 2,400 square foot former laundromat and convenience store space at 925 W. Eighth Avenue, near the Santa Fe Art District. Two first-time Denver entrepreneurs want to have new beer recipes spinning through a former art district laundromat next year. Andrew Moore, 30, and Benjamin Gettinger, 31, plan to open Sojourner’s Brewing Project near the Santa Fe Art District in January. DENVER, CO (April 27, 2016) — Sojourner’s Brewing Project, LLC has signed a lease for property at 925 W 8th Ave in Denver, CO, in the heart of the Art District on Santa Fe. The company plans to renovate the existing building and apply for a brewing license with state and federal liquor authorities and a sales room license with the state to operate a tasting room in the space. That creativity will play into Moore’s brews, which will draw on exotic flavors from around the world. He came to Colorado in 2010 for a graduate program at the University of Colorado Boulder, spending time on Classical archaeology digs in the Mediterranean, an area from where much of his beer-flavoring inspiration arises. “I want my beer to take people to some far away spot, to pique their curiosity when they’re at home between adventures,” Moore said. He looked for space to start a brewery off and on for a few years before partnering with Ben Gettinger to form Sojourner’s Brewing Project, LLC last autumn. Moore and Gettinger hope to open the brewer’s doors some time in early 2017.